Scones are one of my dreaded dishes, meaning I am afraid of them every time I think of making them. I have tried it a few times unsuccessfully. 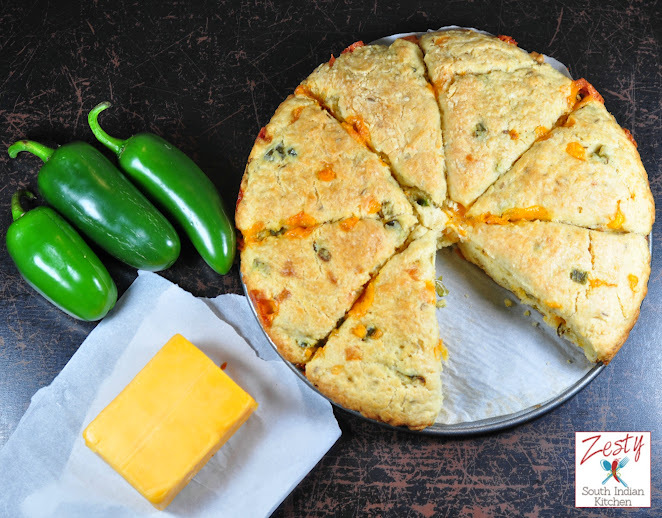 Finally I made this Jalapenos Cheddar Cumin Scones as part of this month Baking Partner’s challenge. This month the challenge was to make either tart or scones. This was suggested by Archana of “Mad Scientist in Kitchen”. I was in mood to make the tart, but ended up changing my mind when I was getting ready to bake and instead made this Jalapenos Cheddar Cumin Scones. According to Wikipedia, scone is a single-serving cake or quick bread. They are usually made of wheat, barley or oatmeal, with baking powder as a leavening agent, and are baked on sheet pans. They are often lightly sweetened and are occasionally glazed. They usually served with tea. Normally scones are sweetened one; there are savory varieties also out there. I had tried making scones few times earlier, most of time failed, so this I was nervous and wanted to succeed this time. The recipe suggested by Archana is from Good Food magazine, it is eggless and use buttermilk. It needs self rising flour, cheddar cheese and sage. I don’t have self rising flour and sage in my hand so I tried with Jalapenos peppers. I read that adding eggs and heavy cream to the recipe gives more puffiness to scones compared to just adding baking powder. Since I had jalapenos and cheddar cheese in my hand which I had bought for making jalapenos poppers, I decide to use them. I know the combo between jalapenos and cheddar cheese will create a wonder. I also added some cumin seeds, it is my favorite seeds which I love to add to everything. I made this jalapenos cheddar cumin scones with two jalapenos de-seeded and then roasted for 2 minutes in butter then made into dough with all-purpose flour, butter and baking powder. Then I gradually mixed the dough in with heavy cream and lightly beaten eggs. Scones are best when they come out of the oven, you can try with ketchup as my daughter did eat like that. However my son found it is spicy and he skipped eating them. Please check other baking partners challenge by clicking the links, here. If you want to join with us for next bake please send me an e-mail at favoriterecipes12 (at) Gmail (dot) com. Here comes the recipe, since I can get success this scone, then it is delicious no doubt about that. Give it try. 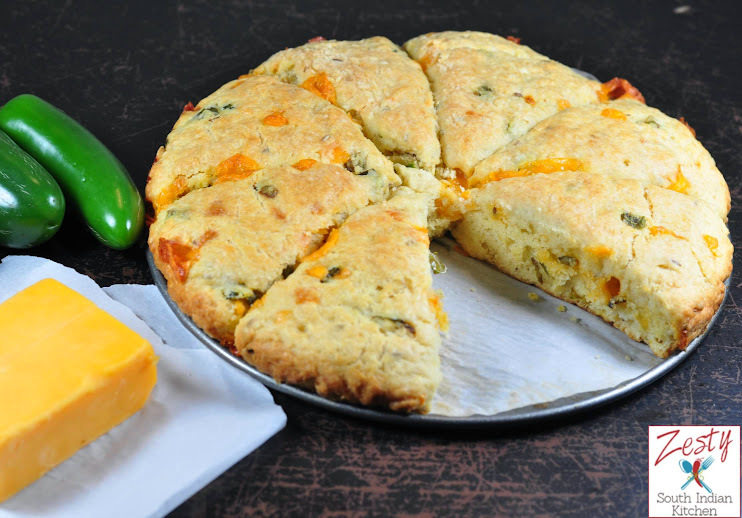 Delicious cheesy, spicy and fragment scones made with cheddar, jalapenos and cumin. Preheat oven to 400. In a small skillet, melt 1/2 tablespoon of butter. Sauté jalapeños until soft, about 2 minutes. Place in a small bowl with Cheddar cheese and coat with 1 tbs. of flour.
. In another bowl, combine the rest of the flour with baking powder , cumin and salt. Cut in remaining butter with a fork until the butter is pea-size. Using a wooden spoon, fold mixture until it begins to come together. Add the Cheddar-and-jalapeño mixture to the dough and mix until everything is incorporated. Turn out the dough onto a well-floured surface and knead gently for less than one minute. Roll dough 3/4- to 1-inch thick and cut into 8 triangles. Brush with egg wash and place on parchment. I adore scones and this combination is perfect. Lovely. This recipe looks great, but I don’t see the cumin on the ingredients list, and it just kind of shows up without being mentioned in the pictures. How much did you use? Rita, thanks for letting me know. I updated the ingredients list, I used 2 teaspoon. These scones so tempting and delicious, surely want to try this soon. Smitha recently posted…CUP CORN RECIPE / BUTTERED CUP CORN / MASALA CORN – AMERICAN SWEET CORN RECIPE..
Looks super delicious dear, flavorful dish..
Looks super yummy..Pictures are great dear.. These scones are just perfect.. I loved all the additions you’ve made to these scones, I’m inspired to try them out next time too! Thanks a lot for the opportunity to suggest this month. I would have not bothered to otherwise. These scones look so yummy!! Pinning!! lovely scones. Must be so tasty. These flavors sound so yummy in a scone. I love jalapeno and cumin. Yum! I love scones of any kind and this savory one looks terrific, fantastic job! Scones looks delicious. Well explained with lots of pictures. perfect scones with detailed pictures as always!!! The scones look so nice Swathi. Love the combination of cheese and jalapeno. Must have been spicy!! 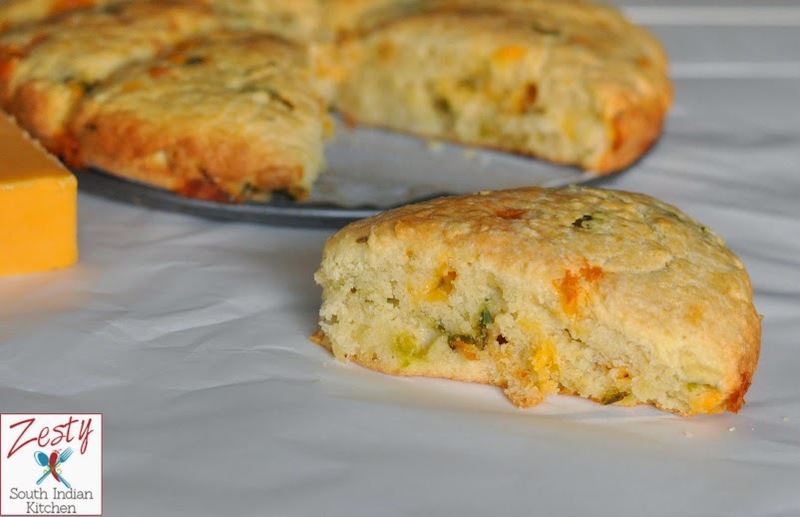 The scones look very delicious..like the addition of jalapenos…will be trying the scones soon. I’m glad you had success with these! They look perfect and so delicious with the spicy peppers – that was a good idea! I have scone failures before too but not this time. These were really good.